Queens Library, an independent system serving the borough’s residents in New York City, is one of the largest circulating libraries in the United States, serving 2.2 million people at its 62 locations. Its Central Library is centrally located in Jamaica, a large neighborhood that is also the county seat and a major hub connecting JFK with the rest of the city. Adjacent to the Central Library is the new Children’s Library Discovery Center, designed by 1100 Architect as a box with four different types of glass and a bright white interior punctuated with color and folded planes. The architects answered some questions about the recently opened library. In 2004, Mayor Michael R. Bloomberg launched the Design and Construction Excellence (D+CE) program to enable the City of New York to pursue an innovative and ambitious public works program in partnership with the city’s most creative and experienced design professionals. As one of a group of eight firms selected for the city’s larger projects (budgets over $10 million), 1100 Architect was awarded this project for the Queens Library through a Request for Proposal process. 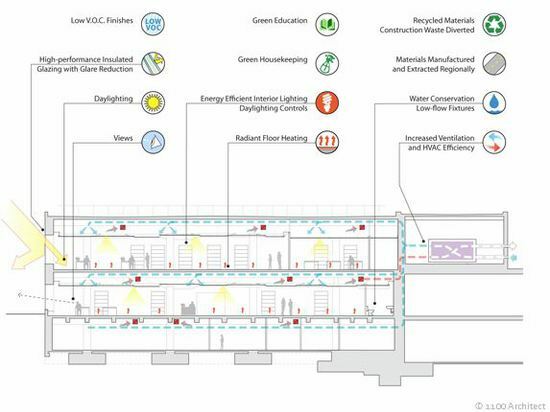 1100 Architect developed a master plan for the renovation and modernization of the 275,000-square-foot Queens Central Library aimed at revitalizing the library’s presence in the community, maximizing the use of its facility, and rethinking programming. 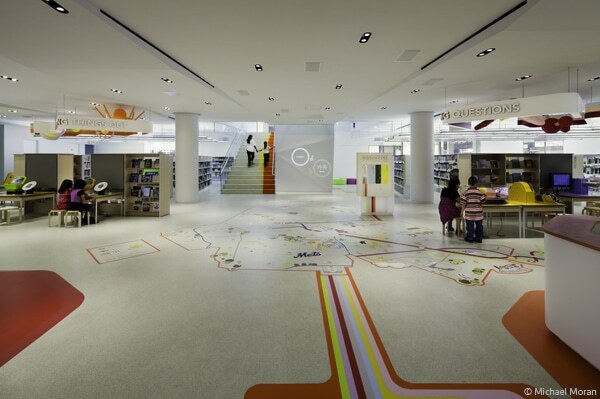 The complete reconception of the design and operations of the Queens Central Library involved a close, collaborative effort with library staff and representatives of New York City’s Department of Design and Construction. Additionally, a full survey and evaluation of the existing building was conducted in collaboration with the structural and MEP consultants. 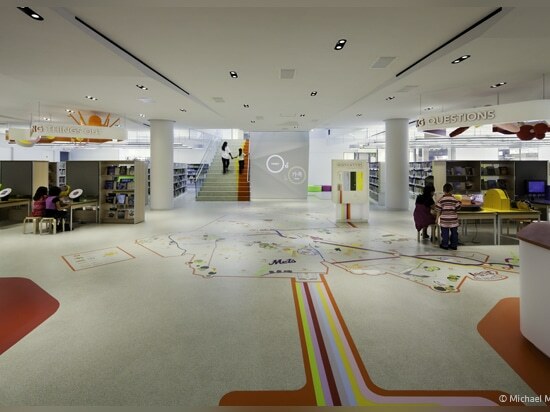 The design and construction of the Children’s Library Discovery Center (CLDC) is the implementation of one of the first phases of the master plan. 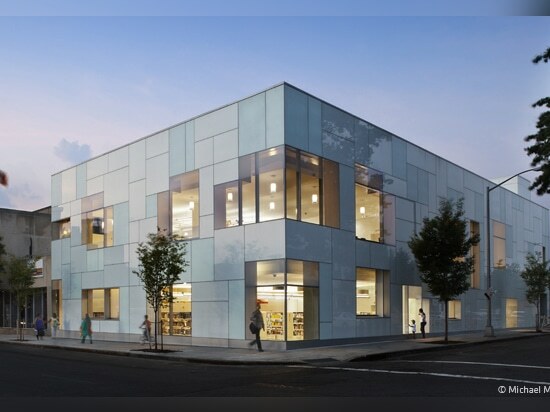 The project was originally planned as a renovation to an existing building that the library acquired to gain much needed space and expand its presence on the block between 89th and 90th Avenues along Merrick Boulevard. Occupying this important corner site increases the library’s visibility and helps strengthen its relationship to the surrounding community. It became apparent early on in the process that to create a cohesive and seamlessly integrated connection with the main library building the existing building would have to be razed and replaced with a new structure. Many options for the CLDC were explored including the addition of an administrative tower above the two-story children’s library. 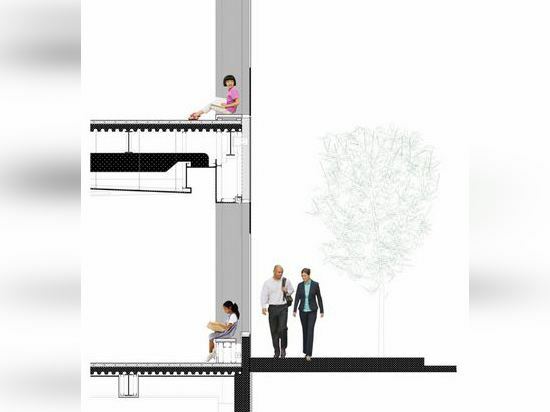 Relocating administrative functions from the second floor of the central library building to a new tower would free up valuable space for public use. 1100 Architect is committed to partnering with the civic sector to create spaces that impact quality of life on a wide-reaching scale. The design of the CLDC is based on the premise that the building will act as a locus of knowledge, cross-cultural exchange, and community building for the diverse, multicultural population of Jamaica and the entire borough of Queens. The glowing glass façade is a beacon in the community and is elemental in increasing the library’s visibility and strengthening it as a central cultural and social destination. In public works, we feel that it is essential that the physical environment assist institutions in their efforts to be good neighbors and engage the community. We often do this by creating a balanced interplay between a building’s interior and exterior. Situated on a corner, the CLDC takes advantage of its exposure to the street, creating a dialogue between the interior and exterior through the use of large transparent windows that also allow an abundance of natural light to enter. The perimeter wall has been thickened to incorporate quiet reading nooks and intimate social spaces that enliven the façade. In our work for the Battery Park City Branch of the New York Public Library, we also wanted to create a design that announces the library to the surrounding community. We worked with the developer to transform the more solid exterior walls of the library into a fully glazed, two-story façade. The views into the bright, colorful interior make it evident to onlookers that the standard library stack and reading areas have been re-envisioned for the 21st century. We also feel that it is important for our designs to contribute to creating healthier communities. For the design of the Riverside Health Center we collaborated with the NYC Department of Design and Construction, the NYC Department of Health and Mental Hygiene, the NYC Office of Management and Budget, and Atelier Ten to develop a new LEED Innovation Credit based on the principle that design can promote health by encouraging greater physical activity. We have applied this concept to many of our projects. 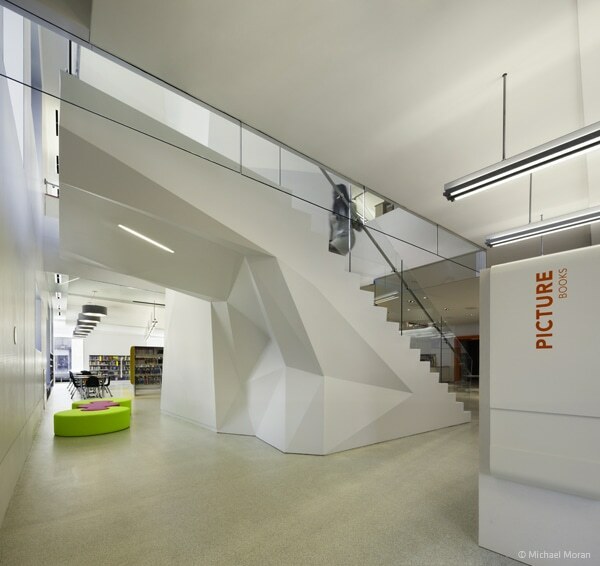 For the renovation of the Department of Linguistics building at New York University, we updated the existing fire stairs with new lighting, playful signage, and artistically designed railings to make traveling from floor-to-floor an easier and more pleasant experience. The graphics change color depending on the direction from which they are viewed – blue if you are climbing up the stairs and red if you are walking down. A prominent staircase in the entrance foyer connects the first and second floors; its modern, open design also encourages visitors to walk up the stairs instead of using an elevator. Large storefront-like windows create a connection between the interior and the exterior, and increase awareness of the Department’s activities to other members of the University and the surrounding community. The CLDC also complies with the New York City Active Design Guidelines. 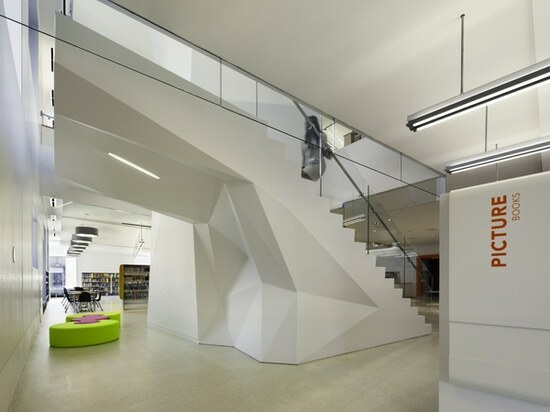 The stair acts as a sculptural element in the space and is strategically placed opposite the main entrance to encourage the use of stairs and encourage visitors to be more actives. How does the building relate to contemporary architectural trends, be it sustainability, technology, etc.? The façade is composed of high-performance insulated glazing with glare reduction to allow an abundance of natural light to enter without placing an extra burden on the heating and air conditioning system. All of the lighting uses fluorescent bulbs, which last much longer and use far less energy than incandescent light bulbs. This is a smart building. A daylight sensor system monitors the light coming in during the day and adjusts some of the electric lights accordingly. The CLDC is full of fresh air. 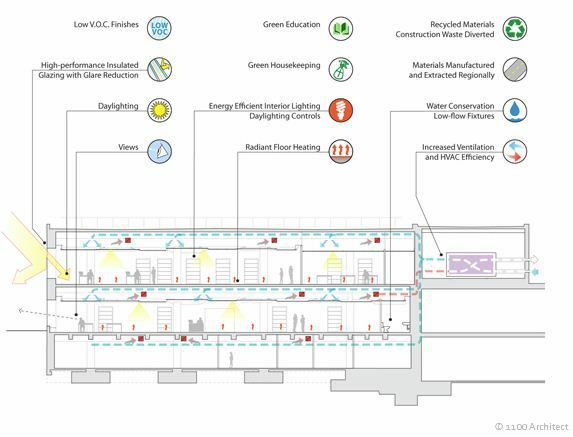 The ventilation system pulls in fresh air from outside for a healthy indoor environment. The building is warmed by heat in the floors. That puts the heat where the people are and it is energy efficient. The natural gas heating and air conditioning system is highly efficient. It keeps the inside temperature comfortable using far less energy than most systems. The system is also easy on the environment. It doesn’t spill any chemicals into the air, ground, or water. The low-flow toilets use only 1.6 gallons of water per flush. Water faucets save water by turning on only when someone is using them. All the paint used in our building is water-based, free of harmful chemical compounds. This paint is easy on the nose and lungs. The furniture was built locally from birch wood grown in sustainable forests. The structural steel in our building is made of 70% recycled metal. Manufacturing concrete adds carbon dioxide to the atmosphere. The concrete of our building includes fly ash, a recycled product. This means less new concrete was used. Green education graphics distributed throughout the library provide information on the building’s sustainable features. Are there any new/upcoming projects in your office that this building’s design and construction has influenced? The high standards for sustainability provided us with valuable knowledge and insights that we are applying to our current work.